Sometimes, a great game comes along that generations to come will plant themselves in front of and play for hours, despite inane length, recycled ideas, and the occasional cheap moments the game can give. Do those elements make a bad game? Usually. 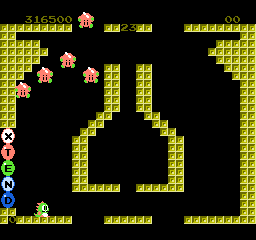 In the case of Bubble Bobble, though, it was the right formula for success. This classic game places you in the shoes of Bub (or Bob, if you’re the second player), a strange dinosaur creature attempting to stop the reign of monsters attacking his once peaceful forest. Traveling upward through the cavern, you will blow bubbles to capture enemies and burst them. When all of the baddies are gone, you move on to the next level. Within the levels, though, you can find items to help you on your quest to annihilate the baddies, either directly affecting you or wreaking havoc on the battlefield. As with every platformer, the further you go, the har der the levels get- until Level 100. Yes. There are one hundred levels. The game really is the same thing over and over for 100 levels. It’s genius in its simplicity, but after playing through so many levels, you could get tired of the formula. The only real variations are when items come into play or when you try to find new ways to attack groups of enemies, since chaining bubble bursts increases the amount of points you receive in the long run. The enemies don’t really do much, either. They walk in your direction some times, but for the most part, you just have to catch up to them and kill them before the invincible ghost whale appears and kills your character. The game isn’t that difficult, either, so long as you take your time. That may sound contrary to the last statement, but there are plenty of tricks to avoid enemies and take them out if you take a second to survey the scene. Most lives are lost in this game because of carelessness, with the exception that the last boss was really tough. In classic Nintendo fashion, he requires memorization and good timing. Let’s get the music ‘evaluation’ out of the way. 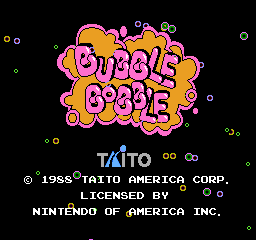 You can’t call yourself an 8-Bit gamer without knowing the music to Bubble Bobble. That tinny melody plays through 99 of the 100 levels, and it’s infectious as hell. The sound effects even seem to compliment the song. It’s not a completely off-base theory to say that someone could have composed the theme and the game was built around that. It’s a fun song, but again, after 99 levels, you might be begging for something else. The graphics are blocky, but not horrendous. The enemy designs are interesting, as are some of the level designs. Some of the tile patterns, though, can be offensive to the eyes. Like most Nintendo games of the time, though, they are colorful, and though every background is black and one screen wide/tall, the graphics certainly are exactly as one would remember them, for better or for worse. This game is a mixed bag. The challenge is certainly there. Even as I was wishing to die just to stop going up the tower, I kept thinking ‘just one more level’ and, before I knew it, I was at the last level. One supreme screw to the player could be that if you don’t get a certain item (according to the manual in level 99), you get the ‘bad ending’. While the ‘bad ending’ probably isn’t too much different from the good ending in the grand scheme of things, it’s hard to believe a player bringing themselves to go through all of the levels again to try to get the best ending. With the password system, however, this can be made to be an easy task, if you remember to record them. Thankfully, the game can easily be played in bite-sized chunks thanks to the short nature of the levels and the password function, something that was not a staple in every NES game. You could choose to play through the whole thing in a matter of two to three hours or play through the first ten levels, set it down for a bit, and come back later. It’s a very nice detail to know if you’re looking for a game you don’t have to commit a large block of time to. It’s also just a fun game in general. It’s easy to pick up and the controls are marvelously easy to perfect- all except one. At least one level requires that you bounce up the entire screen off of bubbles you have produced. This is the toughest mechanic in the game to wrangle, and once you do, the game becomes a cinch. This review is insanely short compared to the others, but there really isn’t much to tell. Aside from the sometimes daunting length of the game, Bubble Bobble is a great platformer and a fun way to spend a few video game hours. Once you get in, though, you know what you’re in for, and hopefully you enjoy it. You’re going to be doing it a lot.